In our busy lives, most of us will likely do some of our holiday shopping online. It can really save time, take the stress out of the holidays and allow you to spend without breaking your budget. How many times have you come home from the mall with so many items not on your list but none of the things on your list? Haha I have done that before. Well that makes online shopping sound great but use caution and know how to stay safe while shopping online to avoid being scammed or have your identity stolen. Cyber Monday is the largest online shopping day of the year and the biggest opportunity for those who want to steal your identity online. 1. Keep your computer anti virus and internet security software up to date. First thing to do is make sure your highly rated computer security software is on and up to date. Run a virus scan and malware scan often. 2. The S is important: Be sure you are on a website that starts with https:. Look at the top of your browser. If you do not see the https do not put any personal information in this site as it is not secure. 3. Do not respond to email you did not sign up for. If you all of a sudden get a random email stating a "too good to be true" deal it's worth being suspicious. Do not click on the email or hit reply. 4. Go Direct: Go directly to the retailers website so you know the site is legitimate. Scammers can setup look a like websites so that's another reason not to respond to spam email. These fake websites steal your identity and credit card information. 5. Keep your virtual cash safe: I have a friend who only uses an expiring card for purchases. If you are going to enter your card number online, do not select the option to have your card number stored online. Also credit card purchases often have better protection than debit card purchases. Avoid using debit card numbers online. 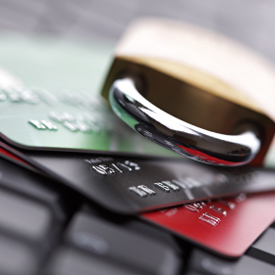 Most credit card companies give purchase protection. Check with your credit card company to find out what that protection is. Stay safe online. Also purchase identity theft protection from our agency Suzanne Brown Agency if you are concerned about the cost (ie. legal cost to to restore your rebuild your credit and dispute charges, bank fee costs for overdrafts, lost wages if you have to take time off to tend to this matter, etc.) associated with identity theft. The costs runs from 20/year to 35/year.